Dr. Bob Yip grew up in Pennsylvania and New York. He later moved to Florida, where he received Bachelors in Chemistry at Florida Atlantic University. Dr. Yip earned his Doctorate of Optometry with honors in 1995 from Nova Southeastern University School of Optometry in Davie, Florida. He completed his residency in ocular disease at the Franklin Delano Roosevelt Veterans Hospital in Montrose, NY. 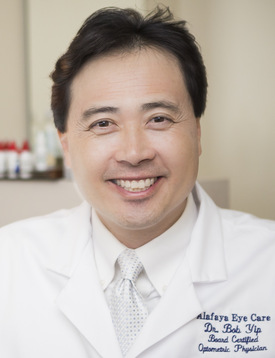 Dr. Yip began his career in a group private practice in Central Florida in 1996. He decided to open his own private practice, where he is able to provide quality service to his patients. He is a proud member of the Florida Vision Quest, providing free eyecare for underprivileged children. When he is not practicing, Dr. Yip spends quality time with his family and friends. Dr. Yip’s hobbies are playing racquetball, basketball and exercising. He enjoys attending the Orlando Magic games and considers himself a big fan! GO MAGIC!!!! Dr. Yip’s motto: Nobody cares how much you know, until they know how much you care.